The Fruits of Your Labor is a board book that explores the size progression of a baby in the womb in relation to a fruit or vegetable. Beginning at the size of a sweet pea and growing to the size of watermelon, each week of pregnancy is documented as a watercolor painting next to a fun, and also true fact about that specific fruit or vegetable, mixed with a playful quip. 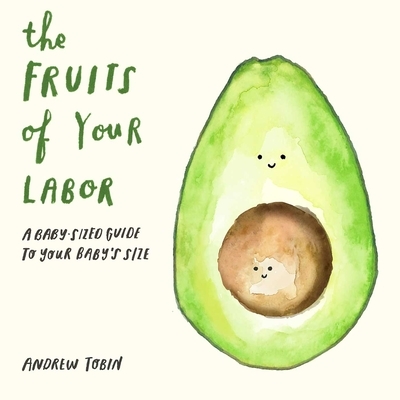 With its endearing illustrations and droll humor, The Fruits of Your Labor makes a perfect gift for expectant families. Andrew Tobin is a Creative Director living in Brooklyn with his wife Erika, and their two daughters. Andrew's love of drawing and painting began at a young age and love of comedy began soon after. While not laughing at Corgis he sees (that body shape, c'mon), Andrew likes to cook, paint, and read voraciously. He wonders if anything else can really be done voraciously other than reading. If you have an answer, please let him know. The Fruits of Your Labor is his first book.